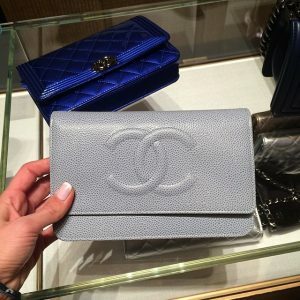 Introducing information on the Chanel Extra Mini Classic Flap Bag. The smallest version of the iconic Classic Flap is the extra mini size. Consistent with the Classic Flap Bags, the extra mini size features the classic quilt, interwoven chain and leather shoulder strap. The bag can be worn as a cross body, shoulder bag or even as a clutch bag. It has a leather interior with one small flat pocket. For the ardent fans of Classic Flap the extra mini flap is the carryall for only the most essential items. It can mainly store a smartphone, cash, credit cards and lipstick. A comparison of this size over the Mini Flap, the exra mini flap is about the same size length but 2.0″ inches shorter in height as the Mini comes in at 5.5″H. Compared to the WOC it also comes in at 2.0″ shorter in height as the WOC comes in at 5.0″H and 7.5″L, and also about 1.5″ shorter in length.